web (the default one) - In this mode items in the top-level polygon are expanded immediately, when the user hovers the mouse over any of them. When the mouse is moved outside the menu area, the open item collapses. Setting the "web" mode from the script is not required because it's already set by default. 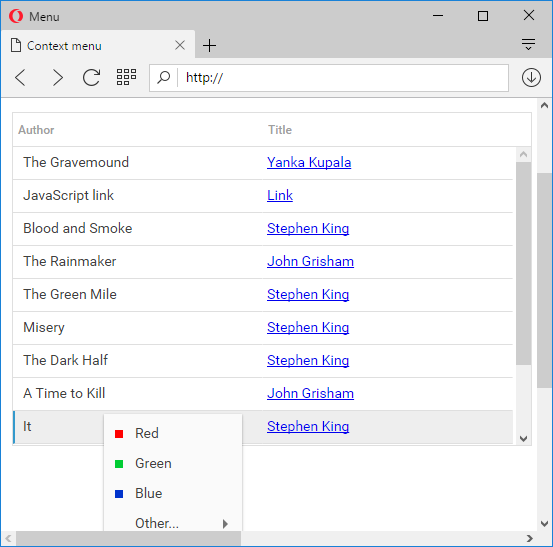 When the Menu is set to the web mode, there is an opportunity to set the period of time, during which the menu will be held expanded, even if the user moves the mouse outside the menu area. By default this time is set to 400 msec. The setVisibleArea method sets the rectangle area in which sub-level polygon items will be able to appear. If this area is not set, sub-level polygon items can occupy any available visible space. When using dhtmlxGrid with a Context menu, you often meet some inconveniences. For example, you need to read the context menu of the record placed at the bottom of the grid, but appearing scrollbars of the browser will impede the implementation of this task. To avoid displaying of the horizontal scroll, set the visible area and define the menu's position (set grid's coordinates to achieve this). In dhtmlxMenu the visible area is automatically calculated and occupies just the visible area of the browser. If a menu opens to the bottom, but there isn't enough space to open menu at the bottom, it will automatically opens on top (even if the scroll allows opening the menu top bottom). By default there is no limits on the number of visible menu items in any sub-level polygon. However, the user can limit the number of visible items in a sub-level polygon using setOverflowHeight method.